UF/IFAS Extension and Research works with many partners supporting invasive species management actions and strategies across Florida. One key partner is the Florida Fish & Wildlife Conserva­tion Commission (FWC), Invasive Plant Management Section. FWC Biologists provide resources and expertise to address threats from Florida’s most disruptive invasive species. FWC and UF/IFAS have worked together for years. They have teamed-up to help residents make the best cost-effective management decisions to preserve unique habitats and ecosystems. Most days are filled with routine questions from land managers and pond owners but on rare occasions there are days we will never forget. Giant salvinia (Salvinia molesta) is an invasive free-floating aquatic fern from South America that is rarely observed in Northwest Florida. The species is on the Federal Noxious Weed List and the Florida Prohibited Aquatic Plants List. 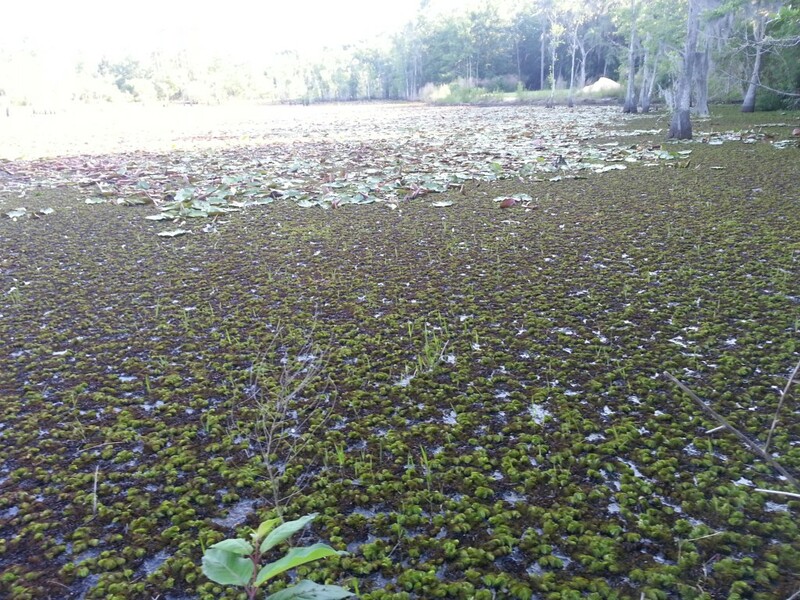 After a site visit with a pond owner, Scott Jackson, a University of Florida/IFAS Extension Agent, identified Salvinia molesta in the Bay County pond and notified the Florida Fish and Wildlife Conservation Commission’s (FWC) Invasive Plant Management Sec­tion. Their staff confirmed the identification of the specimen and a second voucher specimen was transferred to the Godfrey Herbarium at Florida State University. Jackson reported the observation on the Early Detection and Distribution Map­ping System (EDDMapS) housed at the University of Georgia’s Center for Invasive Species and Ecosystem Health. This was only the second reported occurrence of giant salvinia in Northwest Florida. It is a high control priority for the state of Florida due to its high invasive potential. Giant salvinia has caused severe eco­nomic and environmental problems in Texas and Louisiana and in many countries including New Zealand, Australia, and South Africa. Giant salvinia grows rapidly and produces a dense floating canopy on the surface of ponds, lakes, and rivers. It ag­gressively spreads by vegetative fragments and thrives in slow-moving, nutrient-rich warm fresh water. Floating mats of giant salvinia shade out native submersed vegeta­tion and degrade water quality. 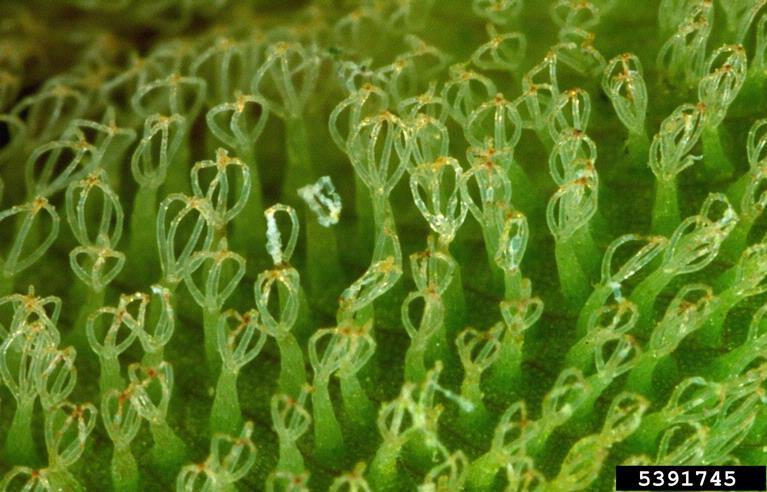 The most distinguishing physical characteristic of Salvinia molesta is the basket- or egg beater-like hairs on the up­per leaves (a hand lens is required) which distinguishes it from common salvinia (Salvinia minima). Common salvinia also has hairs on the upper leaf surface but they do not form basket-like structures at the tips. The upper leaves of both species repel water. Photo by Barry Rice, sarracenia.com, Bugwood.org Rows of egg beater or light bulb shaped leaf hairs are a unique identifying characteristic of giant salvinia. The location of the giant salvinia infesta­tion found by Jackson is precariously close to Deer Point Lake, a 5,000 acre water body that is the main source of drinking water for Panama City and surrounding Bay County. The 2.5 acre infestation was on a 3.6 acre divided pond and both sections were treated. Treatment of the infestation was initiated by FWC in June 2013 at no expense to the property owners. Bay County pond with no observed Giant Slavinia. Taken Oct 2013 by Derrek Fussell, FWC. The pond continues to be monitored and, to date, there have not been any signs of living Salvinia molesta. We will continue to monitor the pond to make sure there is no re-establishment of giant salvinia. Investiga­tions continue to try and learn more about the introduction of the pernicious species to this isolated pond. Read more about the successful treatment regime FWC Biologists used to control giant salvinia in Northwest Florida. 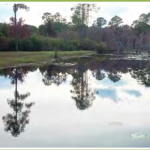 This was published in Florida Aquatic Plant Management Society’s publication “Aquatics” – see page 5. WJHG 7 in Panama City ran this news story. Please see their webpage for additional information and video. “Invasive Plant Threatens Deer Point Lake“. 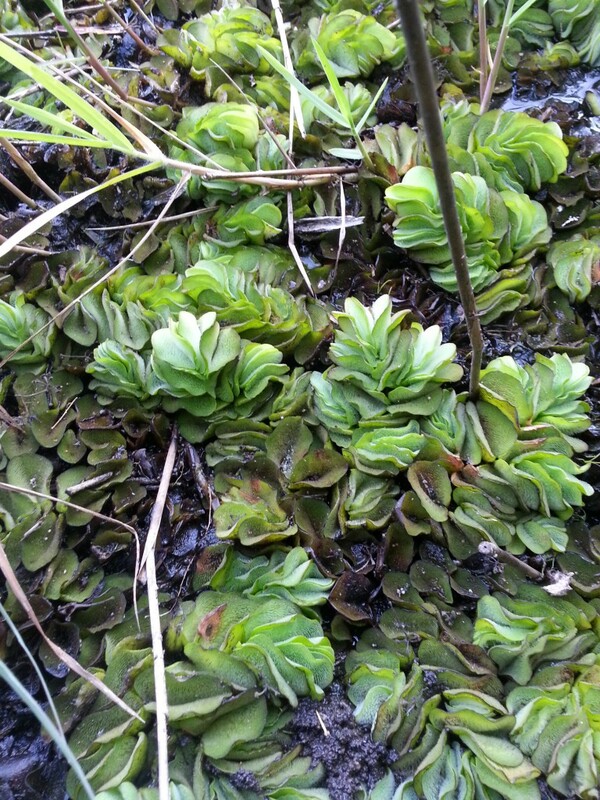 1 Giant salvinia (Salvinia molesta), Weed Alert, Florida Fish & Wildlife Conserva­tion Commission, Tallahassee, FL, 2 pp. 2 The World’s Worst Weeds – Distribution and Biology. 1977 and 1991. L.G. Holm, D.L. Plucknett, J.V. Pancho, and J.P. Herberger. 609 pp. 3 Alien species: Monster fern makes IUCN invader list. 2013. Nature 498:37. G.M. Luque, C. Bellard, et al.